Yesterday a weak low pressure trough passed by to our south and is now over Southern California. This morning's satellite picture (below) shows another system off the coast. This system is also moving southeastward and will move inland over Central and Southern California. We will see a few clouds from this system Thursday with a few sprinkles over the coastal mountains and Sierras. The next low pressure trough will take a more northern track and will be over Northern California from late Thursday through Saturday morning. 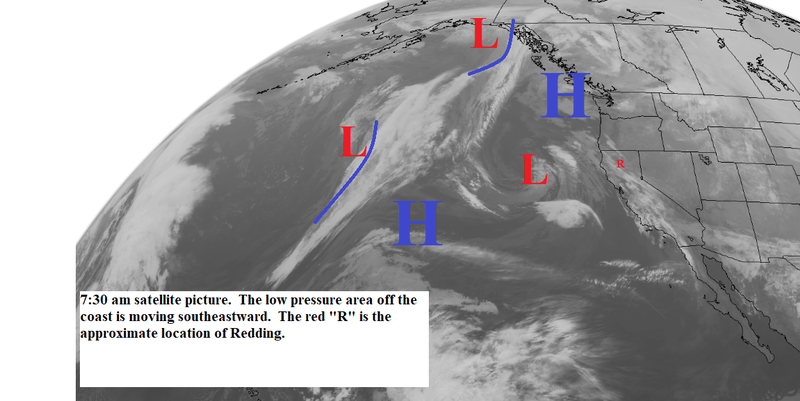 This system will bring rain to all of Northern California. Snow levels will start out at 5000 to 6000 feet dropping to 3000 feet north and a little higher south by Friday afternoon. Saturday we will see scattered showers with the snow levels 2500 to 3500 feet. Saturday night and Sunday the next low pressure trough will move through (see map below). This system will bring more rain to the area with snow levels around 3000 feet north and 4500 feet south. The precipitation turns to showers Monday morning and ends Monday night. Tuesday and Wednesday should be partly sunny and then another storm system Thursday and Friday.